Alvin Jackson in conversation with Richard English. 100 years ago the balance of power in Westminster was held by Irish politicians. John Redmond and Edward Carson remain two of the biggest names in modern Irish history. At the peak of their careers as senior members of the British parliament, they were locked together in combat over Home Rule. Divided by the union with Britain, they had surprisingly much in common. Contemporaries saw them together, and routinely judged them in comparative contexts. But with the partition of Ireland and independence, they have been disconnected, viewed wholly apart, and seen in political contexts scarcely imagined by people at the time. This event is the first to assess them as contemporaries would have done. It uses both new approaches and much new evidence to shed fresh light on their sometimes fraught private lives, their professional and political achievements, and their stands on violence and war. The result will be a strikingly original reassessment of the two men and their legacies. Alvin Jackson is one of the most prominent historians of modern Ireland. He is Richard Lodge Professor of History at the University of Edinburgh, and has been lecturer in history at University College Dublin and Queen's University Belfast. He is the author of seven books, including Judging Redmond and Carson (2018), The Two Unions (2013), and he has also recently edited the Oxford Handbook of Modern Irish History (2017). Among his awards, he is an honorary member of the Royal Irish Academy. 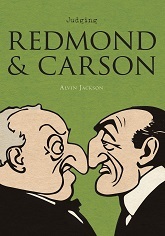 Buy your copy of Judging Redmond and Carson.